Just saw exciting news about this. I see that microtonic transfers sounds to it via the unit's mic. Is it also possible to transfer kits and patterns? Yes, the upcoming Microtonic 3.2 will have a po-32 transfer screen that you access from the new TE button in the top right corner. And since that video was recorded, I have been working around the clock to finish the sounds+patterns transfer interface as well. I'm really curious about the optimise button, would that suggest the PO-32 is a sample based engine? If so, it would open up the opportunity to import sounds outside of microtonic? ah nope, it's a fully featured Microtonic drum synth engine in there. Because it runs on a low power microcontroller, it is limited to four channels (which in itself required some extreme coding wizardry from Magnus). The optimize button analyses the pattern and sounds and tries to rearrange the channels to minimize the voice stealing. While the transfer interface is visible, Microtonic will actually run in "PO-32 preview mode", limiting itself to four channels, so you can hear and tweak the result before transferring. 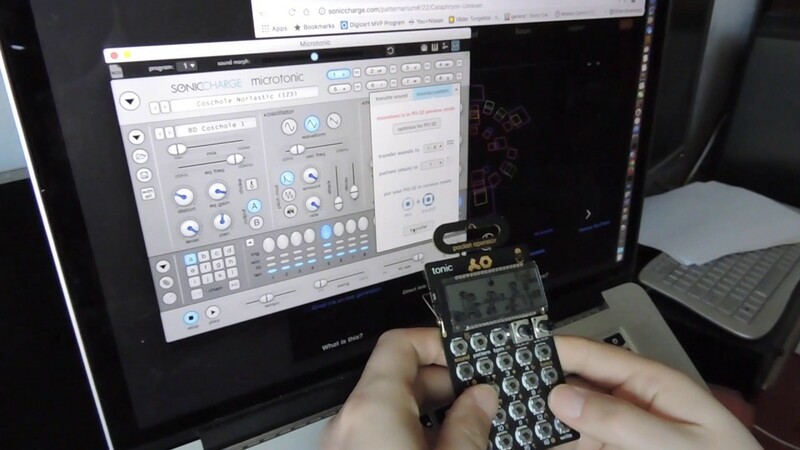 What if I already own Microtonic Vst but still want to but the PO-32 initial bundle? Will I then have two licenses? Can I sell the extra license? I'm in the same boat, bought the bundle as I couldn't wait but already have Microtonic. I'm aware licences can be resold, but wondering if possible maybe to exchange directly for another plugin such as Synplant or a voucher code to use in the store? The PO-32 bundle comes with a Microtonic redemption code. You can sell or give that code away to anyone. I can arrange that for you. Once you have the redemption code in hand, contact me through the support form and I'll set you up with Synplant. I just wanted to chime in and show my appreciation for how awesome this looks (and sounds) - fantastic work @Magnus & @Fredrik! Yes! For Mac. We will begin beta testing shortly. Excellent on the licence help, much appreciated! but when?we are waitting for 3.2 long time,is it with a big GUI? one question comes to mind: will it support Fill Rate? if yes, can it be set from the hardware too? How about gear version of microtonic? I want! For me this device just toy but idea very powerful!!! Taupe, it looks to be the same as in PO-12, you can set the fill rate. tweak a sound in microtonic (knob A on PO-32 tonic represents pitch, knob B represents morph) and press [the TE logo] on the interface to prepare for transfer. Does the hardware replicate the morphing slider in Microtonic? So I could transfer a sound with B set to 0 and another sound with B to full to the same destination, it will allow you the morph between those two sounds? If so, that's just brilliant. I guess you saw the sound transfer video (snippet)?? b.t.w that is a great looking and clear user manual! My mistake, "step multiplier" under section 4. Ok just watched the sonic state vid, PO-32 has the same morphing capability as the plugin. That is just awesome. patternarium to microtonic to po-32 transfer. can it be contolled by controller? midi in?? would be good to benefit from those mini-jack midi ports for the first time ey? sorry, no it cannot, the line in jack follows the same standard as the rest of the pocket operator range, with audio through / sync. Haha, that's cool, but something completely different. He has wired up the actual buttons on the PO, to an own Arduino micro controller, so that he can simulate key presses from MIDI data. Yes you are right. I missed that. But i think a saw it work in another, simular, hacked environment, with a beatstep. I look forward to a better listen to the effects. 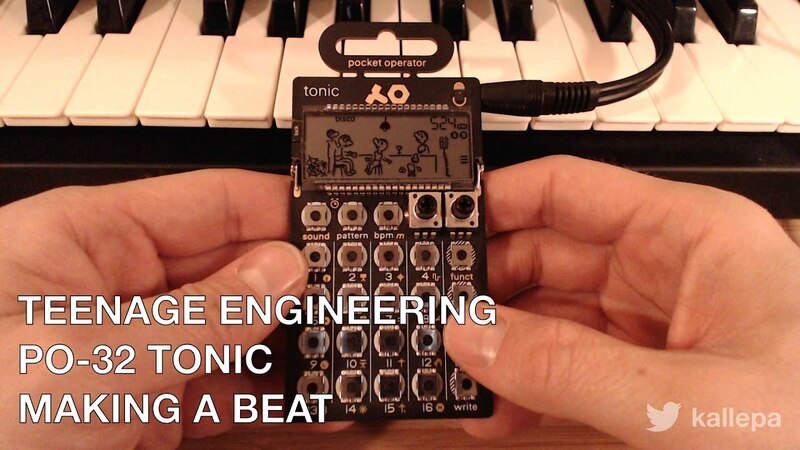 So, I get that part of Teenage Engineering's "thing" is the quirkiness of the LCD readouts, but... I never got the displays of their pocket line of stuff. It seems like a wasted opportunity to offer meaningful display feedback on parameters. Instead, it's an animated cartoon that conveys very little useful information (IMHO). Am I the only one bothered by this?? Is there a reason why they don't offer a more traditional display? On the tonic you have parameter read outs on pitch and morph; and Magnus did a good job utilising the number display (with some text hints) and button LEDs as well. Because of the screen not being backlit, POs were ment to be able to run without a display (like in live situations). It's limited, yes, but then again, our plugins don't usually rely on displays. Fair enough. I do think the display of the OP-1 is pretty cool. What you say makes sense about the pocket line - but I'll need to spend some actual time with them. I plan to order the PO-32 once its available solo (I already own Microtonic). I'm really excited about getting the new PO-32 Tonic! Any chance there might be an iOS app in the future that allows us to quickly transfer patterns/sounds from Patternarium tracks directly to the PO-32? That way we can mess around on the go without a laptop. That feature, if ever developed, would make it possible for me to adopt a new workflow of carrying the PO-32 with me wherever I go, create new patterns while bored (on the bus, in the line at the coffee shop, etc.) and then import the same patterns back into Microtonic and then through Microtonic to a MIDI editor. That would be a HUGE boon for my creative process. Rather than browsing news sites on a smartphone for an hour on the bus, I could be writing patterns, intending to import the best patterns into my laptop-based MIDI editor. 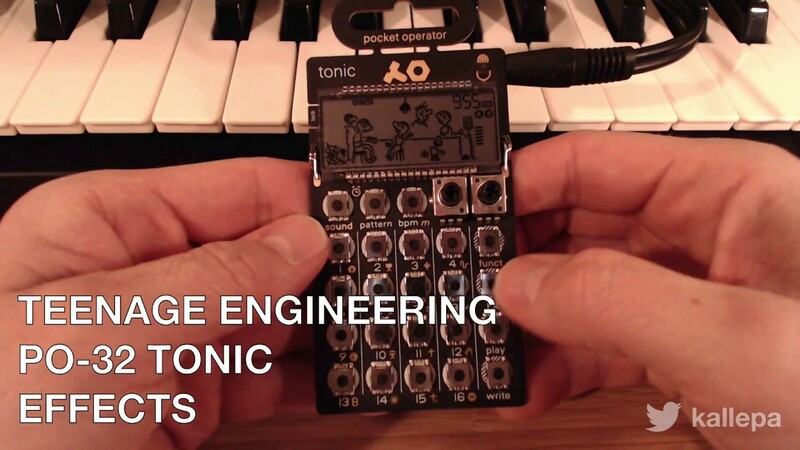 If that PO-32-to-Microtonic transfer is impossible, well, it would be awesome to have Teenage Engineering write a simple standalone utility that can hear the modem-like sounds and convert it to a MIDI file for import into any MIDI editor. Here's hoping something like this happens soon! And if the transfer protocol could be made open source, I'm sure it would only take a weekend for someone to take an arduino/photon/rasberrypi/computer/etc.. and create something that will decode the sounds. I've been toying with the idea of a PO32->MIDI file converter too as an alternative to full integration into Microtonic, but again, feature-wise Microtonic is not quite on par with the PO-32 (with per-channel morphs etc). After the 3.2 launch I'll see if I can make all of this fit on the roadmap for Microtonic somehow, but no promises. 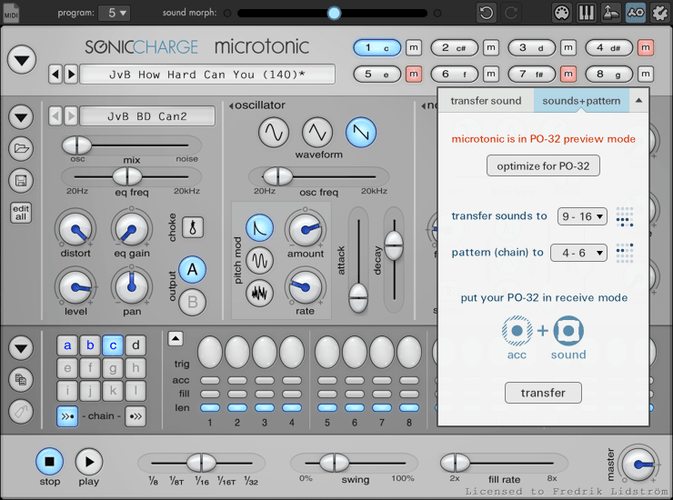 It won't be easy, to the point where it could even make more sense to branch off Microtonic for PO-32 entirely. Which isn't ideal either of course. I think that people will still be very happy with an imperfect solution for getting beats made on the PO-32 back into either Microtonic or MIDI file versus no solution at all. It may be better for it to start off as a standalone utility so that you can put a big, bold disclaimer on it saying: use this at your own risk, it's in alpha, here are the limitations, and you should not expect this utility to ever be improved. This should set user expectations properly so that they aren't complaining about why it can't do this or that. Think about it this way. 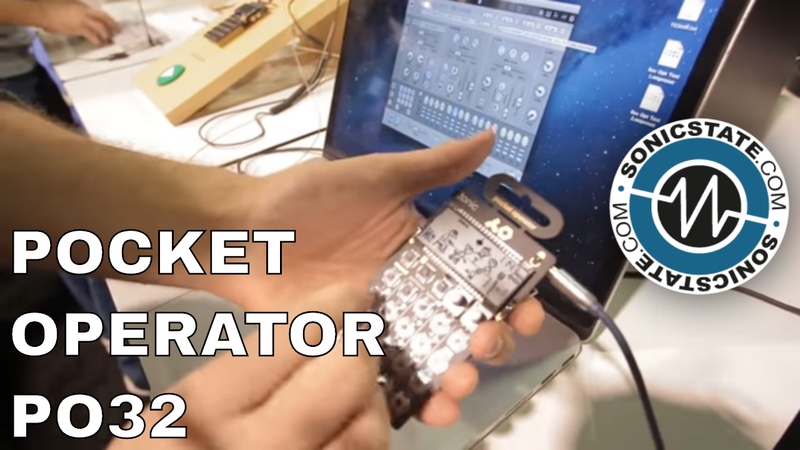 If you were to publish the modem-sound specification only, some clever volunteer would almost immediately write a standalone 3rd party utility to export from the PO-32. Users of this utility would be happy it existed and would not complain, knowing that the utility is better than nothing. Keeping the utility separate means that you can gauge its success and demand for feature upgrades before deciding whether to make it a part of Microtonic or perhaps branch it off (and probably re-brand it). I agree that some 'imperfect' means of getting patterns back from the PO-32 is better than none. I preordered one immediately with the hope that I could toy around with it at work or on a plane as and then pull it back onto the computer somehow. I understand that you never promised that so it's my own issue if you never deliver but PLEASE IT WOULD BE GREAT. I received my PO-32 in the mail today! However, I can't seem to register my Microtonic license... The license card refers to the URL soniccharge.com/tonicnow, but that doesn't seem to be working. I also downloaded Microtonic and tried to register it via the Authorizer, but it says there are no products in my account, probably because I didn't buy it directly from SC? What's the suggested way forward? Hej Niklas. Oj. Det var snabbt utskickat! Meningen var att PO-32 skulle skickas ut först imorgon, så sidan öppnas inte förrän då. Vänligen titta tillbaka imorgon. Då ska Microtonic 3.2 finnas där. Got my PO-32 through today and really excited to use it with Microtonic. However, I've run into a bit of a snag with using the transfer to the PO-32 option. I've had to use the 3.1 version for the RTAS, as I am still operating on Snow Leopard and Lion, and can't update or I'll have to buy all the software again. Is there a standalone program that can be used on these OS to interpret the data and that produces the sound? 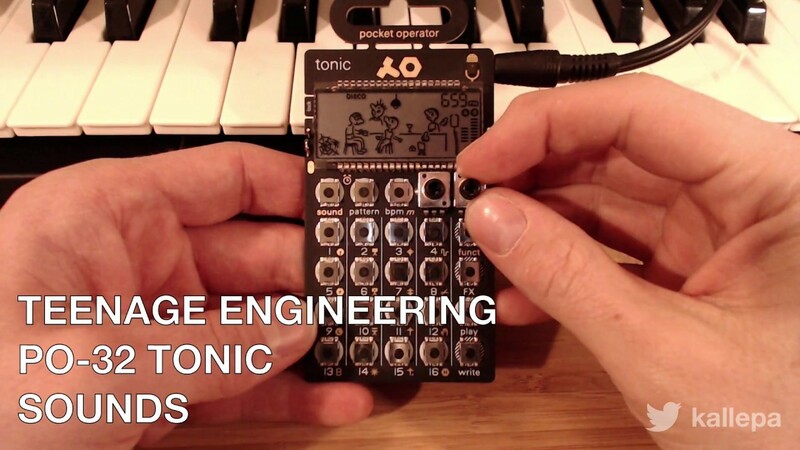 You'll need to install Microtonic 3.2 somehow for transfers from Microtonic to the PO-32. What do you mean "can't update?" Do you mean you can't update your operating system (due to software other than MIcrotonic), or you can't update Microtonic itself? Due to software other than microtonic. Some weird old RTAS ambisonic stuff I use that can't function within Pro Tools 11 as there are no AAX versions of the plug ins. There is nothing wrong with the microtonic software update at all, it's just I am unable to open it as the most up to date OS I use is Lion. Apologies if I'm not being clear. Ohhh, that makes sense. In that case, I guess Microtonic 3.2 is written requiring some libraries/packages that Mac OS X Snow Leopard and Lion do not have. Or maybe, if you're lucky, just the installer has this restriction and Microtonic 3.2 itself can still run on older Mac OS X versions. Unfortunately, I'm not so lucky. Installer works fine, but the lovely grey no access/no open sign comes up on the Lion OS. I'll have to try and figure something out. Just got my PO-32 today and love it. The backup-to-audio-recording feature is awesome even if one cannot yet convert the modem sounds to MIDI or Microtonic. 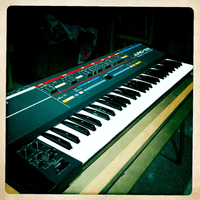 I am writing beats/patterns much more quickly on this than on my Ableton Push, even though the Push has the same grid-based step sequencing input method. The primary difference is that the PO-32's sounds, steps, and channels are constrained; one can easily get absorbed searching through libraries via Ableton. For now I am reproducing the beats I wrote on the PO-32 in the Ableton Live MIDI editor with a mouse in drawing mode. I use the backup feature so that I can go back later, pick the best beats, and try to reproduce the sounds and parameter changes using Microtonic as a plugin into Ableton Live. Cool! I'm very interested in hearing how the PO-32 will fit with people's workflow. Is it difficult to reproduce the patterns in Live? Did you find the .mtdrum files for the PO-32 factory patches in the factory sounds folder? It's very easy to reproduce the basic beat patterns in Live. What I do is hold the sound button and look at the LED grid to see which sounds were used, then look at each sound's LED grid to draw the same beat pattern in Live's MIDI editor. That said, I have not started attempting to replicate any of the parameter changes controlled by the two encoder knobs on the PO-32. That may turn out to be difficult. No, I didn't even know the .mtdrum files existed. Thanks--I will look for those! 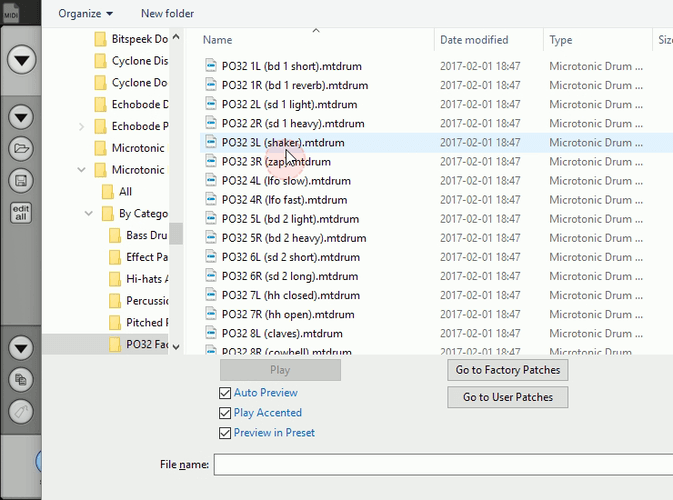 They are in their own folder, "PO32 Factory Patches" under "By Category" in the factory drum patches folder. Thanks for the tip on the factory patches--this is awesome! got mine today- lovely collaboration thanks for putting this out! i'm assuming since not mentioned in the manual that it's not possible to adjust pattern length at this point (aside from chaining), but thought i'd inquire and/or mention it for consideration for some future update. Follow up on the PO-32->Microtonic workflow. For the rotary encoders, I am basically going in and trying to recreate the sound by ear. In Microtonic, I start with the factory sound patches and then mess around trying to match what I hear coming out of the PO-32 in Microtonic. But because I don't understand exactly how the rotary encoders work under-the-hood, it is mostly guesswork. I suppose that with enough time and experimentation, I would be able to form general rules of thumb on what each bar on each rotary encoder means per sound and map out a result. For instance, let's say that every rotary encoder bar is discrete. With 9 bars (8 visible bars plus a zero bar) for each of 2 encoders, that makes for 81 combinations of encoder settings. I could then map out 81 combinations per 16 factory sounds = 1296 total sounds. If I knew the settings in Microtonic to reproduce the sound for each of those 1296 sounds, I could save the entire set and essentially be able to reproduce any sound written on the PO-32 near-perfectly, or at least close enough. Knob B on the unit is the morph slider in the VST. The morph slider allows you to morph from one sound to another. In the VST, morph slider affects all 8 sounds simultaneously in the VST. Whilst the knob only affects each sound independently. I think knob A affects pitch/frequency, I'm not sure without further testing, I think 4 bars is the original pitch. If you are talking about Knob B it is a direct mapping of the morph slider. Try loading the PO32 factory sounds on the left and right side of the morph. Here is a short example. As Magnus already mentioned, the morph is global in Microtonic. 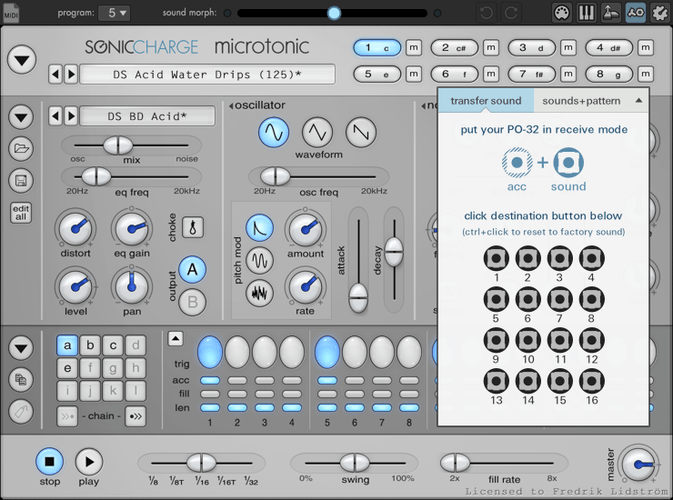 So to replicate it from the Tonic, I think the easiest would be to run a separate instance of Microtonic for each of the 4 Tonic channels and turn on choke.